Islamic Cairo guide is an introduction to the famous street of Historic Cairo, known as al-Muiz street. This pedestrian street is full of Islamic monuments of different eras: beautiful mosques, sabils and kuttabs, houses and khankas. Cairo city wall between Bab al-Naser and Bab al-Futuh. 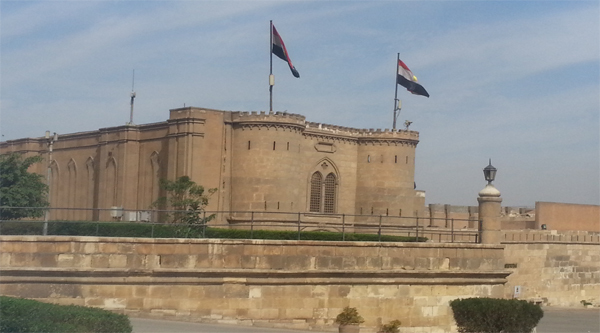 Bab al-Naser Cairo city gate. Facade of complex of Sultan Qalawun. The name of Cairo(al-Qahira) means "the Victorious". It was Egypt's fourth Islamic capital after al-Fustat, al-Askar and al-Qataii. Al-Qahira is today called Cairo among English speakers. The fortified princely city built by the Fatimids leader Gawhar Al Sekelli in 969 A.D. and completed in 971 A.D. It was divided in four quarters by the Fatimid army, and encompassing communities of Greeks, ethnic Europeans, Armenians, Berbers, Sudanese and Turks. The core of the city Bayn al-Qasrayn ("Between the Two Palaces") was a square separating the Eastern and Western palace that was halfway along its main street (now Sharia al-Muiz, which stretched from Bab al-Futuh North to Bab Zuwayla South. Cairo is a treasure-house of Islamic architecture, containing many distinguished Ayoubid, Mamluk, Ottoman and Fatimid period edifices. Cairo contains the greatest concentration of Islamic monuments in the world, and its mosques, mausolea, religious schools, baths, and caravanserais, built by prominent patrons between the seventh and nineteenth centuries, are among the finest in existence. Cairo’s architectural monuments rang among humanity’s great achievements. UNESCO has listed the Egyptian capital as one of the “Cities of Human Heritage”. Few cities on earth display such a dense concentration of historic architectural treasures as does Cairo. Since Al-Moiz street is the most famous one between tourists and Islamic architecture lovers as it has the largest amount of Islamic monuments within its borders let’s start our Islamic Cairo exploration from this street. There are two ways to start our tour with: from famous Cairo Citadel down the street via Bab al-Zuweila to al-Azhar mosque and then to Khan el-Khalily bazaar and to Bab al-Futuh, or we can start directly from Khan el-Khalily bazaar and will explore the area to Bab el-Futuh, then turn and come back following the parallel street to al-Hosein mosque, cross the street to al-Azhar mosque and continue to Bab al-Zuela. Before we start our Islamic Cairo exploration it worth mentioning Khan el-Khalily bazaar, which was established in the 14th century and is considered to be one of the biggest markets/bazaars in the world. All kinds of souvenirs may be purchased here, from statues to 'personalized' cartouches and papyrus art. The gold and copper merchants at the northern end of the Khan are the area known as Bein al-Qasreen (between two Palaces) and at one time there were two great palaces there. Today, its minarets, domes and towering buildings leave visitors impressed with the Islamic tradition of the area. The name of the area derives from an extensive khan built by Amir Jarkas al-Khalil in 1382. By 1511, this area had developed into a major center for commerce. Sultan al-Ghuri ordered the khan built by Amir al-Khalil to destroy and constructed a new one instead, a grander khan. From the 10th to the 18th centuries Al-Muizz Street, which runs through the heart of Fatimid Cairo, gloried in its splendid Islamic architecture. In the years following it became badly run down. It has taken almost 20 years of restoration and rehabilitation for the street to regain much of the splendour it saw in the days of the Fatimids, Ayoubids, Mamluks and Ottomans. Now it is a pedestrian zone and an Open Museum of Islamic architecture which enable people to experience the living traditions and customs of those who lived during the various ages of the Islamic era. Over forty architectural monuments lining the street. The buildings not to miss are the Egyptian Textile Museum, the school of Rokaya Bint Qalawun, the Sultan Barqouq mosque and the school and complex of Al-Mansour Qalawun. Skilled workers and their handicraft stores are essential to the distinct character of Al-Muizz Street, since they provide the vivid atmosphere of the area and the government is keen on settling craftsmen in their original locations, but in a manner that complements the splendour of the area. It is intended to bring back the area of the silk market, the tent market and other enterprises that are part of the Islamic heritage to this street. As we come to the intersection of the main Khan el-Khalili bazaar street (known as al-Muski street) and Al-Mouz el-Din street we see right in front of us Mosque of Shaykh Mutahhar (to the right side) and Mosque of Ashraf Barsbay (to the left side). We will turn right now and follow Al-Mouz street until the end, where we find Bab al-Futuh. On the way to the right and left sides of the street we can enjoy beautiful Islamic monuments of different eras. The Sultan Al-Mansour Qalawun complex to the right, comprising a kuttab (Quran school), mosque, mausoleum, madrasa (school) and maristan (asylum), was built in 1284 and is typical of Mamluk architecture with columned windows reminiscent of the Gothic style. Beyond the masonry entrance, a long corridor gives onto the mosque and kuttab to the right. To the left, the mausoleum retains its original beam and coffered ceiling, ending with the entrance to the maristan. The mausoleum is known to be among Cairo's most beautiful buildings; its main courtyard is shielded from the corridor by a screen and all is finished in stucco; the soaring dome, carved in arabesques, is finished in luminescent coloured glass. And yet it was in the time of Mansour's son Nasir Mohamed Ibn Qalawun, who ruled intermittently from 1293 to 1340, that Mamluk art reached its zenith; Nasir's complex, built in 1295 and similar on the whole to his father's, boasts Cairo's first cruciform kuttab; the entryway is taken from the Crusader Church of St John of Acre and may be the finest extant example of its kind. To the left side you cannot pass by without noticing sabil (water fountain) of Mohamed Ali in Nahassin which has been restored and redesigned as Egypt's first textile museum. The sabil was originally built on the order of Mohamed Ali Pasha to commemorate his son Ismail, who died in Sudan in 1822. It consists of a large rectangular hall opening onto the Tassbil hall, with a rounded, marble façade and four windows surrounding an oval marble bowl. The "logo" of the Ottoman Empire featuring a crescent and a star decorates the area above each window. The sabil's wooden façade and the top of the frame are decorated in a rococo and baroque style, the main style seen in several of Mohamed Ali's edifices. Further up the street to the right side you will find Madrasa-Khanka of Sultan Barquq and then in the middle of the street a beautiful Sabil-kuttab of Abdel Rahman Kathuda is shown from far away. This sabil is an excellent example of Islamic architectural style that it was used as a model for one of the Egyptian exhibits at the 1893 Chicago World’s Fair. Built in 18th century by Abdel Rahman Kathuda, the building provides the pivot for a new street branching off al-Muazz street leaving the sabil-kuttab’s grillwork windows exposed on three sides. When entering the sabil there are 3 doors you can choose to follow; one to the right will lead you to the cistern, another one up to the kuttab and the last one to a small room where the water was dispensed. The street-level inner room is lined with beautifully decorated tiles and provides an interesting view of the façade and minarets of Qalawun and Barquq complexes. We will keep left path and continue walking to the next street intersection where we can visit a typical middle ages house of a rich merchant known as Bayt al-Sihaymi. Located off Darb al-Asfar, just halfway between Bab al-Futuh and al-Husein Mosque, this house undergone extensive renovation and restoration and now welcomes visitors. This nearly 300 years old merchant’s house is actually two houses that were joined sometime in the late 18th century (the older one dated back to 1648). Now coming out of the house lets return to the same path and continue walking to Bab al-Futuh, on the way still many interesting monuments to explore. Soon on the right hand side we will find one of the most ancient mosques in Egypt Al-Aqmar mosque with very beautiful façade, if you want to enter the premises, take your time. 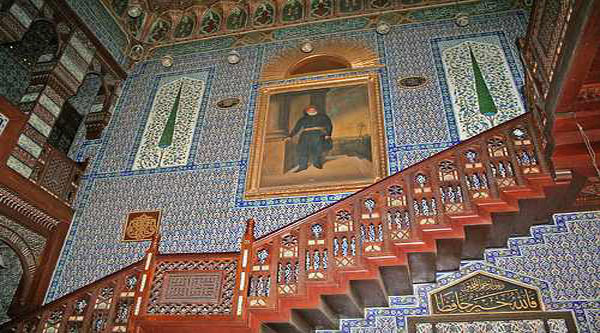 Then continue walking and just some steps from the mosque to the left side of the street we will see a very exquisite Ottoman style façade of the Sabil of Agha al-Silahdar. As we continue moving we find to the right side a very strange minarets dominating the area, these are minarets of al-Hakim mosque with the most ancient inscriptions on its…. Now we reached the end of Al-Muaz street and can see Bab al-Futuh in front of us. 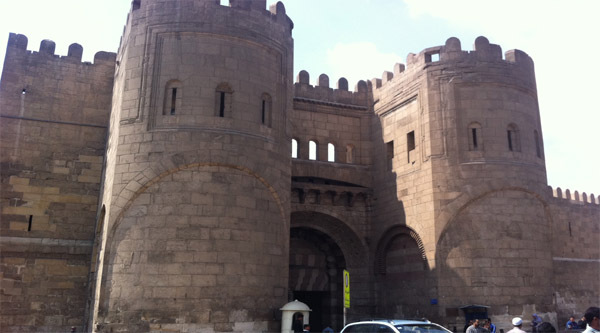 We will pass under the gate and see the structure from another side, as well as walk along a part of original Cairo wall till reaching another gate of Cairo, known as Bab al-Naser. So, we enter the city again and continue our exploration until we reach Hossein Mosque.